On the final day of the school year, last Thursday (this was the last day of out-service and even those of us who work in the summer got Friday, yesterday, off; the children had ended the previous Thursday and sixth grade graduation was the Friday of last week), I was discussing my trip to Italy (to be taken later this summer) with a friend who had once lived in Rome, when she told me that she had written for her friends a little guide of hints about visiting Rome. I asked her to send it to me, which she did, and which I read yesterday and really enjoyed a learned from. I decided to write her a thank you note about it, and how it had helped me, but as I was writing to her, I had the idea that my response might be an interesting entry for this blog. So here it is, very little changed from what I wrote to her, so please excuse its personal aspect, which I think doesn't intrude very much into the things that I have written for other readers to read. I really enjoyed reading your guide. I like that photo you have on the cover of the Coliseum—-it makes it look exciting, but I also see the crowds! I will definitely take advantage of the "line avoiding man" selling the ticket that you recommended. Talk about crowds—-I saw a video on-line of the Trevi Fountain and the immense crowd around it was about fifteen rows of people deep. I think throwing the coins in the fountain bring you these "prizes", because it is more like a carnival game—-you "win the prize" if you actually get the coin into the fountain from way far back where you have to throw it (and backward, over your shoulder, to boot). So it's not so much the magic of the fountain that makes these things come true, it is your skill at the "Coin Toss". You mentioned three coins and I never knew about three of them (but then I remembered there was that movie, "Three Coins In The Fountain"). So I decided to research it see what "bound to be good" thing the third coin was going to get you. It ends up that the whole thing is all scrambled and different versions get you different things. With most of them, the first coin ensures that you will return to Rome. However, there are some versions that have returning to Rome coming from the second coin, the first coin is to bring you romance (although in most versions, romance comes with the second coin). I can see how romance could come first, since Rome (and all of Italy) is just so romantic. Even I am supposed to be able to find romance in Italy, according to one of my sisters (although she didn't say the "even you" part, that's my addition). She simply said, "Keep your eye out for a lover!" Well, miracles do happen, sometimes. But anyway, I could see how romance could come first and then you would really want to come back, especially if the romance was with an Italian instead, of say, a tourist from Russia. Not that that couldn't be a romance, but that it would maybe make you want to go Russia, not back to Rome. There was a woman I met on a cruise (it wasn't a romance, because she was with her husband) from the Ukraine who was very taken with me and she (and her husband) insisted that I take their address and phone number because I was so welcome to go to the Ukraine and visit them. (The Ukraine has not yet gotten onto my visit-wish list, though.) So one, does, of course, meet people from all over the world. In fact, I wouldn't be going to Italy at all this time if it hadn't been for bonding with the newlywed Italian couple during my trip to Fakarava last summer (where they were finishing out their honeymoon), who insisted that I come to Rome to visit them. But they kind of let that thing slide (as I knew was always a possibility); this whole year, they only wrote me (answered) two e-mails, although in each one they continue to insist that I had to go to Rome this summer and stay with them. However, meanwhile, they had a baby in April, and they didn't write me back until two weeks after I had booked everything by myself without getting any clear confirmation from them. I don't know if I will even see them at all; in this recent e-mail, they said that they spend the month of July "on the coast" (wherever that means), but maybe could "drive back to Rome" to see me if they knew when I was coming. I think I will send them my itinerary and hotel information so they can figure this out. But I hate the idea of interrupting their vacation. It would be cool if "the coast" for them meant the Amalfi Coast, then I could see them down there, but somehow, I think where they go must be closer to Rome, because they have spoken of some place where the tourists never go. But we'll see. Now, regarding the third coin (and, by the way, it turns out that the "three coins" of "Three Coins In The Fountain" were all the first coin of three different women), it gets even more muddled. The third coin could bring you marriage, (after the second or third coin brought you romance), or it could bring you divorce (which, logically, could follow marriage, or it could follow romance, meaning a divorce from the spouse you had prior to having the romance in Rome! ), or, kind of boringly, the third coin could bring "charity", although it didn't specify charity for whom. Maybe your romance drives you in the poor house (spending money wildly on "la dolce vita", so now you need charity? Or the spouse you have divorced took the house and everything else you owned so now you need charity because of that? But probably they mean charity for others. However, all the coins are actually for charity anyway, as all those coins are cleared out regularly and given to charity. And I guess doing something like that is essential, for, judging by the crowd of people I saw in that video, that fountain would be completely filled up quite quickly! This charity angle is actually quite smart. One of the best uses of coins I have seen was at the Faaa Airport in Tahiti. Right at the spot where you board your international flight, they have a big box where you can deposit all your left over South Pacific Franc change that you no longer have any use for and that you cannot exchange back for U.S. Dollars (currency exchange places will only exchange back paper bills). They specify that it is for a children's charity, and one really would like to get rid of all that heavy and basically useless (at home) change, anyway, and this is for a good cause. Now, if only Tahiti would spread the legend that coins deposited like that will ensure the likelihood that you would come back to Tahiti (the more coins you put in, the greater your chance of a return visit), they would be rolling in charitable donations, I would think, like coins in the Trevi fountain! It's funny when I think about it—-I am normally a "I want to go as many different places as I can" kind of a guy, so "going back" to a place is not normally on my mind. I would look for someplace new to go to. However, thinking back on my traveling life, I have actually gone back to a few places. And Tahiti was one of them, and that was last year. Kauai was another one, when I really felt that I should go back to a Hawaiian island I hadn't been to, I nevertheless was specifically drawn back to Kauai, so that's what I did, instead. I would definitely go back to Kauai even again, and, in fact, really do plan to (I want to kayak and camp along the Na Pali Coast). Many years ago, I went back to Sweden. Actually, I had been there several times. That was my uncle's main residence each year (he also lived in Helsinki, Finland, and Dana Point, California during other portions of the year), and when he died, I was executor of his estate. Doing that work brought me to Sweden twice, the second time I was there, I lived there in his condo for several months. I did a lot of touristy things while there, it wasn't just all work, but still, I consider those "working" trips, not vacations. But I met some people from Northern Sweden while I was there in Stockholm and made friends with them, so I ended up going back to Sweden twice, as real vacations, to see them. So, two vacations back to Stockholm after the several months I had lived there, and two trips to Northern Sweden (which also included visits to Stockholm) to stay with my friends. London, and then Midlands England were also places I went back to. I had made friends with people from Darlington (in the Midlands) when I was traveling in Mexico, so I stayed with them twice in England, with repeat visits to London both times. I for sure will be tossing two coins into Trevi fountain. But the third one, I'll have to think about that…. Going back up to where I mentioned the Coliseum, I think Italian (or Latin?) is such a hard language to write, because there is no good way that I know of to remember which letters are written double. I always have to look up how to spell cappuccino (or is it "capuccino", or "cappucino"? ), and the Coliseum is another one (is it "Colisseum" or "Collisseum", etc.?). Even one of the cities I am staying in on this trip, I have to look up its spelling every time: Santa Maria Navarrese (in Sardinia); it is hard to remember that it has two r's, but all the other letters are single. Italian seems to be filled with words like that. Peculiarly, it wasn't until I was in the middle of planning for this trip that I became clear that pizza actually was a genuine item of Italian cuisine. Somehow along the line, I had gotten the impression that it was some kind of an American creation that wasn't eaten in Italy at all, you know, like chow mein (that apparently is not genuine Chinese food but is a bizarre American creation) or, oh, I don't know, "chips and salsa" is probably not genuine Mexican food (I imagine that they would eat regular tortillas, not something crispy). I do understand that the Italians do not have the milk- or other flavored-with things versions of espresso except in the mornings (with, or as breakfast), that only Americans will order, say, a cappuccino or a "latte" in the afternoon. The waiter or bartender will serve it to them, but they find it to be very strange. But regular plain old espresso, it would be served all the time, any time after a meal, and what would be strange would be to not have that after a meal. So I am glad to learn these little variations on a cuisine theme and also what things are called in Italy versus the American version. A "latte" is simply a class of milk, for example, whereas our "latte" is called a "café latte" (and for mornings, only). So I need to make sure that I eat like an adult—-no cappuccino past breakfast, no meal without vino, no meal without ending with an espresso. I also never quite understood the deal with all the courses, the Antipasti, the Primo, the Secundo, and all that stuff, and was always kind of embarrassed whenever I went into a fine Italian restaurant here in America ("Am I supposed to order something from each of those courses, I can't afford that! "), but now I understand how it works. It's interesting how big of a trendy deal it is among Italians, now (especially the young and hip), having what we call "happy hour", but for them is called "Aperitivi", where one can actually have a full meal with a series of appetizers for just the cost of drinks. My Lonely Planet Italy guidebook said that is because of the terrible economic straits that Italy is now in, a lot of people (especially younger people) simply can't afford to eat out in the traditional way very much any more. I loved it when the guide book said, "Leave it to Italy to find a way to put the glam into recession." Sue Nihiser, Linda Polan, and I, have become fanatics about "happy hour", here. Well, Sue and Linda have been that for a long time, but for me it is new. We usually are able to get half price on certain wine, beer, and drinks, and discounts on a whole list of different appetizers that we can explore and share. It's really loads of fun, dining out costs less, and, for me, it's a way to get out of the rut of always wanting to order the same thing all the time. It seems that chefs are the most creative when it comes to appetizers. So, in my bid to be careful about spending money in Italy—-in another words, I am a budget traveler (but for sure I will treat myself to some splurges), it is good to know about the possibilities of this "aperitif" thing. Of course, since Italy really is the food capital of Europe (if not the world), I won't be crazy about "budgeting"; I do want to take advantage of what so many visitors say is the best thing of all about Italy, the great food! Also, back to pizza, there is an awful woman who has a terrible website on which she rants about everything going on culturally in America, and one of her targets is "pizza", which she seems to put in a category like corn dogs at a carnival, or something. Like pizza is not a food that sophisticated adults should ever eat; to her, it is more like child-friendly junk food, like CocoPuffs cereal or a McNuggets Happy Meal. But I realize that pizza was a serious food item, for sure developed in Italy and a legitimate food creation. (Good to know that I should eat it with a knife and fork, in Italy.) It's possible, though, that after eating pizza in Italy, I may be ruined for having pizza in the United States! If so, then it's a "good" kind of ruin, though! You wrote about bread being brought to the table. That reminded me of Mexico, where things on the table that we are used to having for free end up being charged for—that meant when they brought out a basket of rolls, you would find that they had observed how many rolls you ate, and how many pats of butter you used, and were charged for them. This also included how many sugars you put in your coffee, or how much cream. That was shocking to me as an American, but then when I thought about it, it did make sense, even though I disliked it. Here, we expect to have endless cups of coffee and unlimited soda refills. I am sure each tiny cup of espresso is charged for in Italy. I love that word, "Agua Frizzante"! I'm going to have to have that all the time, because I would love to be able to say that word! (Normally, I would just drink "still" water.) When I was learning Spanish for my "vagabonding" in Mexico (three months of roaming around), one of my favorite words was "ferrocarril" (which means "railroad", and I did quite a bit of traveling on the Mexican ferrocarril). I loved how it sounded, the two trilled r's in one word, and also the creation of the word, itself, in that "ferro" means "iron" (as in the word "ferrous") and "carril" is "way" or "road". So that sounded so poetic and romantic, "the iron road" or "the iron way". I guess our "railroad" is really no different, but somehow hearing it come out of "ferrocarril" (rrrrrrrrr rrrrrrrrr) made it sound so much more wonderful. And guess what, Italian's "railroad" has the same derivation; well, duh, Italian and Spanish are both coming out of Latin; it is "ferrovia", so they have the same "ferro" for the iron, and then "via" for "road" or "way". I see that I am now starting to get into the fun of these words, which makes traveling so much more enjoyable and enlightening. I remember that moment in Stockholm, when for a while I had been thinking that their words were so ugly. For example, the subway stop that was nearest to my uncle's condo was "Liljeholmen". Just a horrible bunch of mis-matched consonants (but it helps to know that "j" is pronounced like our "y"). And the street that my uncle's condominium tower was on, "Grenljusbacken". Ugly ugly ugly. However, I was there during the Christmas season, so there were many things oriented toward shopping for Christmas. There was a department store advertisement in the subway car, talking about a line of perfume and bath soaps that had "Lilje" as part of their name. In the advertisement was a photograph of a beautiful woman bathing in an elegant bathroom with lilies in crystal vases all around the room. I looked at that poster, hummm, lilies, the name "Lilje", I wonder…and looked up the word lilje in my Swedish dictionary and saw that it meant "lily". Okay, so what is "holmen?" It means "harbor". So my (formerly) ugly-looking and sounding subway stop name actually meant "Lily Harbor", and I imagined a field of lilies growing right by the beautiful water of the lake that my uncle's condominium was next to. In fact, the name of Stockholm, itself, is also a "harbor", in this case, "Timber Harbor" ("stock" is "timber"…you know the phrase "lock, stock, and barrel"? Those are the parts of a musket or a gun; the lock is the metallic mechanical part with the flint and trigger and so on, the barrel is what the bullet goes through, and the "stock" is the wooden part). In former times, the great northern forests of Sweden were its greatest resource, and trees by the thousands were harvested and the timber was floated down the water to Stockholm for sale to the rest of the world. So Stockholm actually got its start because it had a great harbor for receiving timber. Posters in the subway (tunnelbana) also had advertisements with photos of candles in the windows, which is a Christmas tradition. Light is "ljus" and "gren" is a modifier that has something to do with Christmas, so "grenljus" are the candle lights that people put in their windows for Christmas. "Backen" means "to go up a hill". I stepped out of the subway car at the Lily Harbor station and began walking up the hill to where my uncle's condominium was, at the top of it. It was dark, now (which it had been ever since 3:00 PM, this being winter in Sweden), and as my feet crunched on the snow as I walked up hill, I could see the warm, welcoming glow of Christmas candles burning in every window, reflecting a peace and love as I trudged through the snow up the hill; I was experiencing the very embodiment of that street's name, "Grenljusbacken". The whole world of Sweden had opened up into being a world of fascinating natural beauty, and from then on, I translated the meaning of every street and place name, and it was like reading Emily Dickinson poetry everywhere. I am now going to have to be doing that with Italian. "Duomo". Gosh, everywhere there is a duomo, That was confusing me…why does every town have a major building with the same name? Florence has a "Duomo", Siena has a "Duomo", I wouldn't know if I had visited this "duomo" or that "duomo". Well, finally I learned that "duomo" means cathedral. Ah, now I get it! Well, of course, they all have a cathedral. Okay, so now it makes sense. Anyway, understanding those things will make a big difference! For some reason, when I see the name "Capitaline" (as in Capitaline Hill or Capitaline Museum), it always makes me think of "Palpatine", as in "Emperor Palpatine", the evil ruler of the galactic empire in Star Wars III. And, of course, there is some sort of a connection, I am sure, between the Roman Empire and the epic of the Star Wars empire. Come to think of it, that hooded man statue that you showed in your section about Campo de Feuri that had carvings representing all the executions that took place in that square actually looks like "Palpatine" (or I should say, Palpatine looks like him!) 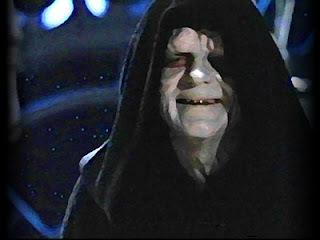 Look at this photo of Palpatine-—do you agree? It is clear that Lucas (or his designers) used real scenes from Italy to help fashion this science fiction futuristic world. I think I will avoid the Campo de Feuri in the evenings, though (stabbing and shootings, looking for fights with Americans?)! I'm here to enjoy, not have an in-depth tour of a Roman hospital. I'm worried enough about pick-pockets! I have found that I am glad that I have an up-to-the minute Lonely Planet Italy Guide Book (which even talks about Italian government scandals! ), even though I have done a lot of my planning with the simpler, more abbreviated Rick Steve's Italy guidebook, which I bought in 1999 (I figured Rome has been there since B.C., so a 1999 travel book should be okay!). It's good to have him zero in on the most important or popular things to do and see, but then to get more in depth with one of the other, newer books once the trip is narrowed down. For Rome, I have appreciated having a Frommer's book on Rome alone, also, and its walking tour of Ancient Rome and its one on Romantic Rome I plan to follow exactly point by point (my hotel in Rome is in the middle of a triangle made of one point at the train station, one point at the Coliseum, and one point at the Spanish Steps), and the small Dorling Kimbersley EyeWitness Travel book Top Ten Venice is a true gem (it's got a whole heck of a lot more than just "ten" things…it lists the "top ten" of about 40 different categories, and I was so pleased to see, after I already booked it, that my hotel was listed in that book as one of the top ten mid-priced hotels). In planning this trip, I was constantly having to battle out the choice between seeing a lot of different things versus seeing more in depth fewer things. Obviously, regarding Italy, itself, I opted for the "seeing lots of different things". I simply could not eliminate any of the places I chose to go to—-definitely not Venice, definitely not Rome, definitely not The Vatican, definitely not the Amalfi Coast, and definitely not Pompeii. The one piece of art in Italy that I wanted to see more than any other is the Michelangelo statue of David, so that meant that I had to go to Florence. And besides, "Florence" is the given name of one of my sisters, my mother, my grandmother, and my great grandmother. They are all actually named Florence Nightingale as first and middle names, except for my great grandmother, whose last name was Nightingale. I was always told that the famous Florence Nightingale (the founder of the profession of nursing) was my great grandmother's first cousin, so they shared the same paternal grandparent (I think that means), so that's why they had the same last name. That was always presented as fact, that we were related to Florence Nightingale and that's why that name was always carried down through the generations. Now, I am not so sure about that. Maybe that was a fantasy…but I would like to somehow research that to verify the truth. For one thing, I'm not sure that the dates line up correctly…such as, could my great grandmother and Florence Nightingale have been in the same generation? I kind of feel that the famous Florence Nightingale was a generation (maybe two) older. Of course, we still could be closely related, but that my great-grandmother and she might not have been as close as first cousins. Anyway, there was some reason the famous Florence Nightingale was named Florence, and I think it was because even though that family was English, they were living in Florence when she was born and so she was named after that beautiful city. (I will have to research that, too.) So if all this is true, then the name of the female line of my family from my sister back to my great-grandmother are all carrying a first name that came from Florence, Italy, so I should at least spend a day there! The Rick Steve guidebook said that while Florence is incredibly wonderful during the day (the very essence of the Renaissance), it is kind of dull at night, but Siena, which is only about an hour's train trip away, is spectacular in the evenings. So he recommended spending a day in Florence, but sleeping in Siena. So that’s how Siena got on my list. Actually, I am more excited about seeing Siena that I am Florence. However, I am getting excited about Florence, because I have learned that the three things I want to see there [the Galleria dell'Accademia (where the Michelangelo statue of David is), the Uffizi Gallery, and the Ponte Vecchio (bridge) over the Arno River] are all in walking distance from the train station. Things apparently really are much closer together than they seem when we look at them on the map with "Los Angeleno eyes". So I like the idea that I can go to see such wonderful things but not have to hassle with travel distances and confusing (and unreliable) public transportation to exhaust me before I even get to them. And finally, Sardinia….in my last three vacations, what I wanted was beaches in a tropical paradise, so last year I went to Fakarava (a coral atoll in the Tuomoto Island chain of French Polynesia), the year before, I went to Palau (in Micronesia, next to the equator and about 500 miles east of the Philippines), and the year before that, back to Kauai. I haven't used up my "fantastic beach desire" yet, so all this urban traveling in Italy and going through museums and cathedrals and the like was starting to depress me a little (despite how wonderful I know it will all be). So I remembered that Italy was on the ocean (duh), so just for fun, decided to do a Google search for the best beaches in Italy. I got a list of the top 10 best beaches in Italy, and nine of them were on the island of Sardinia. Looking at all of them, one really stood out as my clear favorite, the beach Cala Goloritze, so I decided I had to go there. If you look at this website (that's the hotel where I am staying on Sardinia) and scroll down to where they have "the beaches of Baunei", you will see pictures of Cala Gloritze and several other fantastic beaches that are all in a line next to each other up the coast. I will staying in the town of Santa Maria Navarrese, which, as you can see, is really the only town close to the coastline, because those northerly spectacular beaches are in a protected area like a national park, so there is no building or development close to those particular beaches. I realize, of course, that there is a beach at Venice (the lido, which means "the beach"), which might be kind of cool to go to, and also, of course, the whole Amalfi Coast. However, whether I will go to either of those beach areas depends upon what other things I will want to do, instead. I'm going to be in Venice for only two days, and Amalfi for two days. I'm not sure if I will have time for going to the beach, although it would be great if I could. But I am giving Sardinia three days (actually, a great deal of the first day will be getting from the Amalfi coast back up to Naples, flying to Sardinia, and then driving a rental car for two hours down from the airport in Northern Sardinia to Santa Maria Navarrese, which really shortens the first day, and then having to go to bed pretty early at the end of the third day because I have to get back up to the Sardinia airport for an early flight out of there back to Rome and Los Angeles, so really, Sardinia has one full day and two partial days) and that is intended to primarily be my special beach time. That's funny what you wrote about the Roman taxi drivers not understanding tips and trying to give you the money back. That's almost worth using their services at least once! So, once again, thank you so much for your very cool and useful tips, and I will be taking advantage of almost every single one! Your advice has enhanced my trip, and I really appreciate it. All my best to you for a fantastic summer. I am sure you will love everything about your house when you make it the way you want it to be. Summer in your own beautiful back yard could be the best summer you ever had!